Teachers and other educational workers have praised the agreement, saying that it’s a major step forward in consolidating their rights. 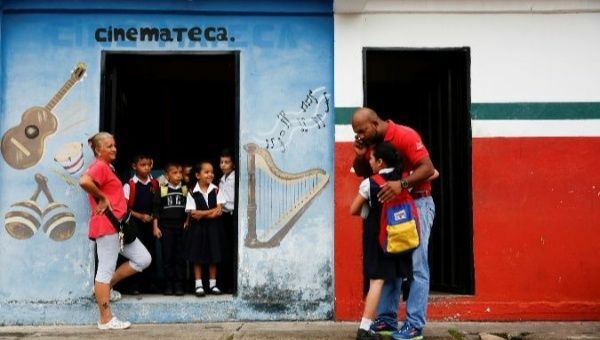 April 13 (teleSUR) A new collective contract titled the II Unitary Collective Contract 2018 – 2020 was signed between education workers and the Venezuelan government on Tuesday. Coming into effect immediately, the terms of the contract guarantee a 100 percent pay raise, stronger social protection, especially for disabled workers and pensioners, and will benefit over a million unionsied and non-unionised workers, including 500,000 teachers, 152,000 laborers, 79,000 adminsitrative workers, 67,000 kitchen workers and 205,000 retired workers. Teachers and other educational workers have praised the agreement, saying that it’s a significant step forward in consolidating worker rights. The II Unitary Collective Contract 2018 – 2020 was the result of months of negotiations between trade union federations and the national government.